Nigerian youngster Victor Osimhen has joined Belgian first division outfit Charleroi on loan from Wolfsburg until the end of the season. The Nigerian has found playing opportunity limited at the German club, hence the decision to go on loan in search of regular playing time. The forward joined Die Wolfe in 2016 after a spectacular performance at the 2015 FIFA U-17 World Cup, where he emerged the all-time highest goal scorer of the FIFA U-17 World Cup. The lanky forward scored 10 goals, breaking the record earlier held by the duo of Florent Sinama-Pongolle (France) and Souleymane Coulibaly (Cote d’Ivoire) who recorded nine goals apiece. Immediately after the tournament in Chile, he signed a pre-contract agreement which saw him join Wolfsburg officially in January 2017, after he turned 18. 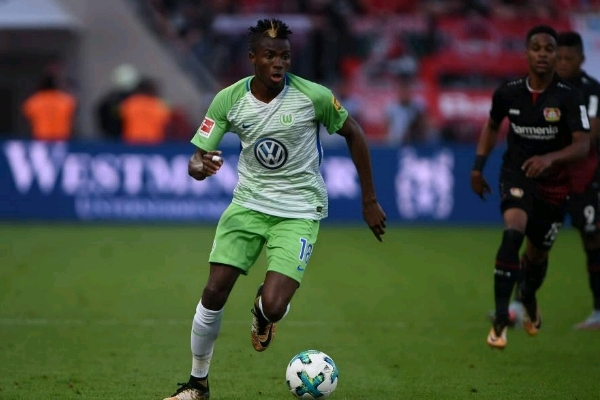 The young Nigerian forward made his debut for Wolfsburg main team in May 2017, as a substitute against Borussia Monchengladbach, but he has found playing time quite difficult to come by, due to stiff competition, poor form and fitness issues, all of which has contributed to his inability to break into the first team of Wolfsburg. Last season, he made just 12 German Bundesliga appearances, with only three coming as starts for Bruno Labbadia’s side and sadly he failed to score a goal in those appearances. This season, in search of regular first-team football, Osimhen was invited for trials by another Belgian Zultem Wagem, but the first division outfit rejected the opportunity to take him on loan till the end of the season, stating that he is too prone to injuries even though he is still very young. However, he will play the 2018-19 league season in the Belgian top-flight with Charleroi. The Zebras as they are nicknamed will play Kortrijk in Saturday’s league encounter and Osimhen may well make his debut for the Belgian side. Charleroi is placed 11th in the log after picking just three points from their opening four games.